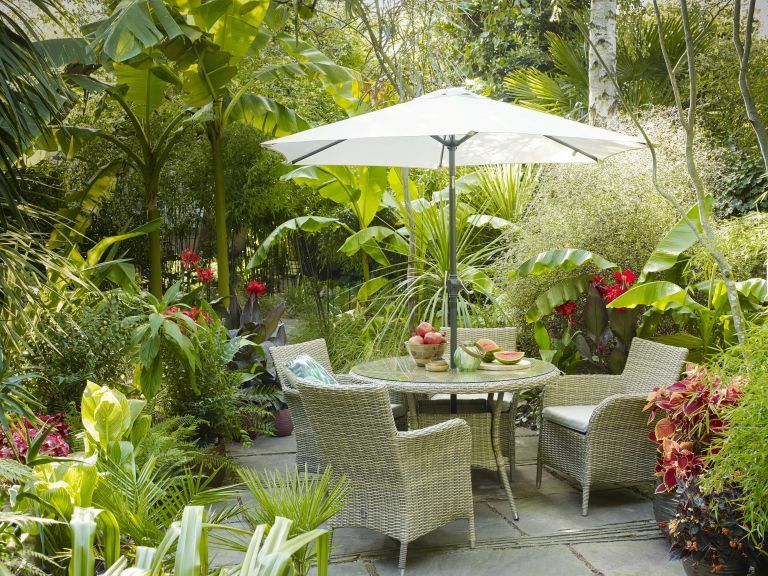 With the prospect of a glorious British summer ahead, now is a great time to review your garden, and create a garden dining space that will ensure you make the most of the warmer months. Purchasing the right garden furniture is a must, but with so many styles and materials to choose from, where do you start? We've picked the garden dining sets that will cover every garden size and design, from sturdy, traditional-looking ensembles to clever, slimline solution for small urban gardens. When you've picked the outdoor dining set that suits your garden best, head to our sourcebook of garden retailers for all your garden shopping needs. What are the best garden dining sets? Which garden furniture is best will always be specific to your needs and the design of your garden, but we think that it's hard to beat the simple, one-piece design of the Oslo Dining Set from Cox & Cox. It looks like a traditional picnic table, but with a sleek contemporary edge, and will easily accommodate the whole family. The first thing to consider when choosing garden dining sets is the size of the space you have to work with. A large solid wood dining table and chairs may be a dream purchase, but they will overwhelm a small garden or patio area and provide little room for manoeuvre. So make sure you are realistic about the size of the table and chairs you choose and check all the measurements carefully. Outdoor furniture comes in many sizes and layouts. There are also versions that fold away for easy storage and flexibility. If wooden garden dining sets are on your wishlist, there are plenty of designs to choose from. Always check to see if the product is made from wood sourced responsibly and from forests certified to the Forest Stewardship Council (FSC). Hardwood products are pretty hardwearing, but make sure you clean them thoroughly after the summer and treat with a wood oil or preservative. Softwoods are more fragile and need a bit of TLC, so treat them on a regular basis. Metal outdoor dining sets have a more contemporary feel, are great value for money, and their lightweight structure means they are easier to move around and store away. They are also simpler to maintain, being wipe-clean, ready for the next use. For the ultimate in style and comfort, rattan or wicker garden dining sets are a wonderful investment, and the natural material is a great way to blur the boundaries between a garden room or conservatory and the garden itself. If your heart is set on one particular material, we have the best wooden garden furniture, the best metal garden furniture, and the best rattan garden furniture in our buyer's guide. Made from aluminium with a soft grey powder coated finish, this simple, one-piece dining set has the look of a traditional style picnic table. Perfect for family dining, this set has a simple, sleek design with slatted finishes to the benches and table. Durable and contemporary-looking, the Chilson set from Garden Trading is perfect for adding a touch of industrial chic outdoors or indoors. The Cement Fibre top is fully weatherproof, and the benches make for a convivial alternative to traditional seating. The set also comes with a stool. The Catania is nothing short of luxurious, providing plenty of room for lounging as well as dining, and including sumptuous detachable padding. The sofa comes in a two- or three-seater size, which makes the set suitable for smaller or larger outdoor spaces. The Swann set is clever and will add comfort to even the smallest outdoor dining areas. We love the square table design (quite rare in outdoor dining sets), and the comfy cushions that are easy to clean. This set may not have the reassuring weight of some other sets on our list, but it's affordable and very good-looking. This lovely 6-seater from Dobbies has everything a dining set needs to have to be suitable for the variations in weather typical of the British summer. It's made from a sturdy weave and includes removable, UV- and water-resistant cushions, and a safety glass tabletop.